Copenhagenize.com - Bicycle Urbanism by Design: I Got My Bike Back! No, it wasn't my Bullitt, unfortunately. But two weeks before the Bullitt got stolen, my other bike - pictured above - was nicked. It's a 1955 Swedish Crescent. Bloody irritating. 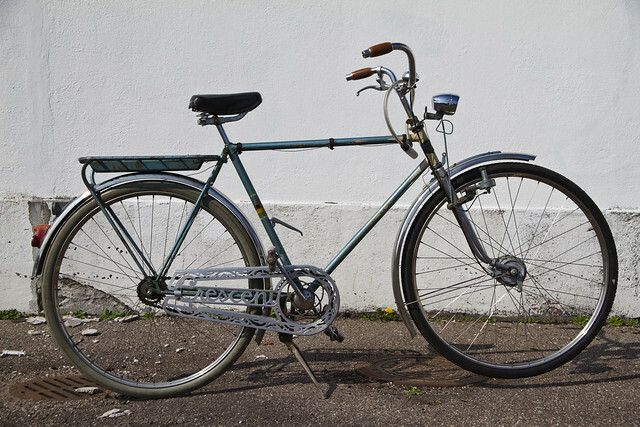 Vintage bicycles are in high demand at the moment, fetching a high price. Bicycles that only three years ago wouldn't even garner a second glance by bicycle thieves are now targeted. I was sad to see it go but didn't bother blogging about it. A month or so ago, Hans from Larry vs Harry was standing with Claus, who works at Larry vs Harry. Hans spotted a bicycle rolling past and noticed that it was the Crescent. It's an incredibly unique bicycle and it's hard to miss. Hans mentioned it to Claus. Claus - the reigning Danish cargo bike champion by the way, we call him Copenhagenthighs - took matters into his own hands. He hopped onto his Bullitt and set off after the Man on the Crescent. He gave him a bit of a shock braking hard next to him and shouting "Where the hell did you get that bike!?" The guy riding the Crescent was not a little spooked. He explained that he had bought after seeing an ad on the bulletin board at at the Faculty of Life Sciences at Copenhagen University for 500 kroner. For a bike that can fetch 4000+ kroner at the moment, that was a bit disappointing, but hey. The guy was cool about it and instantly agreed to deliver the bike back to me. Claus called me from the spot and told me about it. A week later, an Austrian guy studying here in Copenhagen came by. Elio. My favourite Austrian of the month. He had the Crescent with him and was happy to hand it back. I promptly gave him four beers out of the fridge for his trouble. Brilliant. Not only is this social media lark sometimes quite cool, I'm also grateful for Hans and Copenhagenthighs for keeping their eyes on the street. The whole Bullitt episode earlier this year was a brilliant rush but this little episode also help restores my faith in humanity. Thanks to Hans and Claus and also to Elio!